Crohn's disease (CD) is a condition that falls under Inflammatory Bowel Diseases, alongside ulcerative colitis (UC). CD results in an abnormal immune response that attacks tissue within the GI and leads to inflammation in the intestines, usually around the end of the small intestine (called the Ileum) and the colon. This inflammation can damage the lining of the intestine and lead to a number of symptoms, such as abdominal pain, diarrhea and tenesmus (the urge to go #2 without the actual need). There are a number of genes that have been acknowledged as contributing to Crohn's disease- this genetic susceptibility interacts with the diet and gut bacteria to produce the abnormal immune response seen in CD. 25% of CD cases are diagnosed during childhood and adolescence, which are critical times for ensuring normal growth and development. One unique factor of CD compared to UC is that it affects the small intestine more so than the colon. 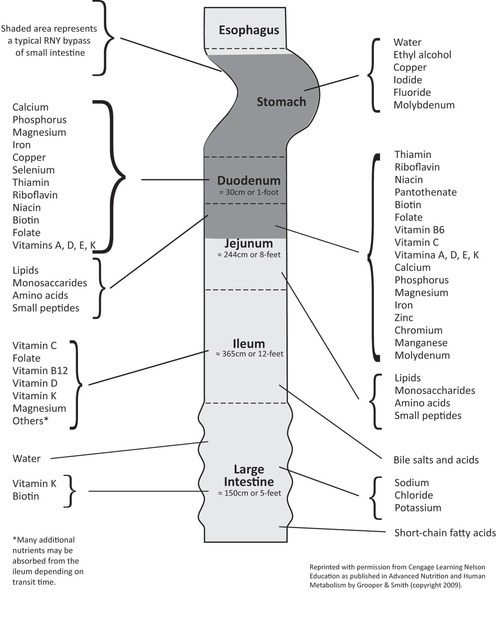 The small intestine is the site of absorption for most nutrients, so damage to this region is more likely to result in malnutrition, alongside other unpleasant symptoms. Individuals diagnosed with CD are much more likely to experience weight loss and have increased nutrient needs. Nutrition therapy for CD can vary depending on the individual's genes, intestinal bacteria, medication use, food sensitivities, severity of disease, overall lifestyle, and whether or not an individual is having an active flare up. Individuals with CD have increased energy and protein needs during active inflammation/infection. Total calorie needs can depend, however, as individuals with active CD tend to reduce their physical activity, decreasing the number of calories that they burn. Also, restricting higher fiber foods, milk products (if lactose intolerant), spicy or fried foods, caffeinated beverages, gas-producing foods and any other food previously identified as a trigger may help alleviate flare-up symptoms. Some individuals have indicated a benefit from eating small frequent meals as opposed to larger ones. During these active times of CD, individuals are at higher risk for specific nutrient deficiencies such as iron, B12, zinc, calcium, magnesium and copper. Individuals should also monitor their stools, checking for oil droplets/abnormal smell, which can indicate fat malabsorption that may worsen weight loss and fat-soluble vitamin absorption. Medications and surgery can lead to increased needs, especially in the cases of folate, B12 and vitamin D. For children & adolescents, inadequate nutrition can lead to impaired growth, which can worsen the symptoms of CD, compromise the immune system, and have long term effects for bone/metabolic health. Remission of flare-up symptoms does not necessarily mean an individual is free of any complications. Depending on the extent of the damage done to the intestines during flare ups, malabsorption can still occur. Generally, it's important to maintain a healthy weight, ensure adequate protein intake, and monitor for any signs of micronutrient deficiencies (e.g. Bruising easily and iron deficiency). Eating a well-balanced diet with a variety of foods while taking a multivitamin/mineral supplement can work to ensure adequate nutrient intake. Research has also shown that individuals with CD have lower levels of antioxidants. Antioxidants can help to reduce oxidative stress and protect against inflammation. However, foods high in antioxidants (fruits, vegetables, beans, etc.) tend to also be high in fiber, which may not be tolerated well. So, it is important to identify food sources that are tolerable, and slowly add them into your diet. Little research supports the efficacy of antioxidant or fish oil supplementation. Individuals with CD are also at a higher risk for kidney stones and should limit their consumption of high oxalate foods (such as spinach, beans, wheat germ, and tea), while ensuring adequate calcium intake. As long as they are tolerated well, foods like yogurt, which contain probiotics, are also good sources of other nutrients essential for the management of CD and should not be discouraged. However, probiotic supplements vary in the strains of bacteria they contain, and all of those tested thus far have not shown benefits for any CD patients. Managing Crohn's Disease is a lifelong task, and nutrition can and should play a critical role. Many patients unfortunately require surgery at some point, though this does not cure CD, and reoccurrence often happens within 1-3 years after surgery. While general recommendations can be given, any specific changes to your dietary and eating habits should be coming from a doctor and a registered dietitian who have worked with you individually.